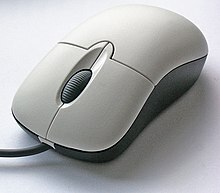 A computer mouse with the most common standard features: two buttons and a scroll wheel, which can also act as a third button. ↑ Early computers such as Colossus and ENIAC were able to process between 5 and 100 operations per second. A modern “commodity” microprocessor (as of 2007) can process billions of operations per second, and many of these operations are more complicated and useful than early computer operations. "Intel Core2 Duo Mobile Processor: Features". Intel Corporation. Retrieved 20 June 2009. ↑ In 1946, ENIAC required an estimated 174 kW. By comparison, a modern laptop computer may use around 30 W; nearly six thousand times less. "Approximate Desktop & Notebook Power Usage". University of Pennsylvania. Retrieved 20 June 2009. ↑ "computer, n.". Oxford English Dictionary (2 ed.). Oxford University Press. 1989. Retrieved 10 April 2009. ↑ "'Software' from Collins Concise English Dictionary". Wordreference.com. Princeton, NJ: Princeton University. Retrieved 2007-08-19. ↑ "Clare Pendar switches from". Visualux. Retrieved 2012-03-28. ↑ "Clare Home". Clare.com. Retrieved 2012-03-28. ↑ "Rugged Keyboards for military, industrial and extreme applications". Cortroninc.com. Retrieved 2012-03-28. ↑ "Pad printing, Green Pad printing & screen printing". Tampo. Retrieved 2012-03-28.